Susan Covell Alpert is the creator of the “Chaos to Control” program and author of “Driving Solo: Dealing with Grief and the Business of Financial Survival.” Susan shares her unique tale of survival and explains how one can get through the aloneness, fear and sense of feeling completely adrift. She released a manual to save one’s financial life, which includes how people thrive without a partner. Find out more about Susan Alpert at www.susanalpertconsulting.com. Jason Hartman: It’s my pleasure to welcome Susan Alpert to the show. She is talking to us today from my old home town, Corona Del Mar, California. And it’s funny what a small world that is, but she is the author and the creator of Chaos to Control Program. 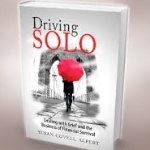 And the book title is Driving Solo: Dealing with Grief and the Business of Financial Survival. When someone passes on, it’s not only the emotional part, but it’s a whole plethora of business and paper work issues that one has to deal with at a very vulnerable time in their lives. So Susan is here to help us plan for this eventuality that will probably come to all of us, and it’s great to have her on the show. Susan, welcome. How are you? Susan Alpert: I’m great. Thank you so much for inviting me to participate with you. Jason Hartman: Well, the pleasure is all mine. This topic really isn’t covered anywhere. You’ll always hear lawyers and commercials saying to make a will, maybe a living trust. But it goes way beyond that, doesn’t it? Susan Alpert: It does. I’ve thought naively at the beginning, oh so I’ve got a will, my husband and I have that, we have trusts, I knew where the papers were. I thought that I was in pretty good shape. Oh how wrong I was. It’s really overwhelming. Jason Hartman: Yeah. Well, Larry your husband of what, 46 years? Susan Alpert: 46 years. Yeah. Jason Hartman: Wow. That’s amazing, especially by today’s standards. So he passed away in what I think was 2008? Susan Alpert: Yeah, that’s correct. Jason Hartman: Okay, yeah. Sorry to hear that. And tell us about what happened there, and let’s kind of dive in and cover all these areas the book covers, all these different stages. Susan Alpert: What I found is, after Larry died, I who had a great organized mind, I ran several major firms, I knew business. I wasn’t afraid to tackle anything, but I did find that when I was faced with it, I was practically paralyzed with emotion. And the fact that I knew things didn’t mean that it would work, and I didn’t know as much as I thought I did. I wrote the book because I had lived through the experience of watching my strapping, perfectly healthy, never sick, perpetual golf fan husband go from this strapping man to somebody that I actually buried. So during that, the emotions of being a care giver, of watching numbers go up and down, the fear, what happened when he died, how I handled relationships with children, and the reason I’m bringing this up is because the experience that I bring is not only my business experience, but the personal. So it created the need to put together a method that somebody who is facing this, and as you said most of us will face this, and ultimately we have to handle it ourselves. I put together something that made it easier. Jason Hartman: Right, right. So first of all, maybe let’s talk about kind of the first part of this: from grieving to living. And then we’ll get into some of the more technical details. Susan Alpert: The period from when you finally lose somebody until you discover that you can be alive, it’s a slow process and a long process and at the beginning I thought, I don’t know how I’m going to get through tomorrow, much less the next hour, much less the rest of my life. And there are steps that you have to take. You have to be open, you have to let yourself grieve. So important. You can’t just gloss over and say, okay well that’s done. I’m really sad. I’ll mourn for a couple of weeks, then I’ll go back to work, and I’ll go back to my friends. It doesn’t work that way. You have got to go through the grieving stage. And once you do that initially, you’ve got to start putting your life in order. Organizing the papers that you have to handle. You have to find a way to work, a way to do this. And I covered that in my book. This is what you should do. For example, set aside an area to handle these pieces of paper – not your dining room table, not your bedroom, not where you’re living, but the place that will be dedicated to the past, and then leave a place for the present living. And that’s kind of how it goes. And during that period of organizing, you’ve got to figure out what you need to do, who you need to contact, what you have to do to save yourself in the future, things that have to be done immediately. And you really don’t want to move, but you also have to learn how to let people help you. And for some people it’s difficult. I was one of those. But there are things that people can do even if you’re a very private person. There are things that they can do to help you that won’t interfere with your personal matters, but can help you get started and move on. Jason Hartman: Sure. Well, I like this idea of creating, just using the space wisely so that you kind of have the past and present and future in different spaces, kind of segmenting it physically and in one’s mind as well. So that seems like a great Idea, and something very simple to do, right? Susan Alpert: Yes, and you could be sitting at your dining room table thinking about the person who used to be sitting across from you, but you’re not looking at their handwriting on papers that you had signed together, you’re not looking at death certificates. It may be in your mind, but it doesn’t go as a searing knife through your heart. So, it’s simple but it’s really essential. Jason Hartman: Oh, yeah. Absolutely. Okay, well what else? The part about the journey back to happiness? Susan Alpert: Yeah, that’s a very interesting part because what you have to do is realize you’ve got to make some life for yourself, you’ve got to make some changes and you’ve got to get outside a little bit. At the beginning it’s very hard just even going out with a friend, and it’s awkward, and you have to do that. The journey back to happiness is a very slow process, and it doesn’t mean you’re going to have a normal life. You’re going to have a new life, and it can be great. But there are some side steps and some bumps along the road. I found that I personally needed grief help. I went to a grief counselor. I think talking to somebody is very important. If somebody is not in a financial situation to have one on one counseling, hospitals have support groups. Your doctor can tell you where to go. Your church, your synagogue… it’s amazing how much help there is and how good people feel when they help you. That’s a major step to take. Get help of any kind. Jason Hartman: Yeah, sure it is. Reach out. Okay, well let’s drill down here if we can, and just talk about the chaos and how you got control of it. First talking about what kind of papers, were your affairs just much more complicated than the average person, do you think? Kind of tell us about some of the stuff you had to deal with there. Susan Alpert: I think mine was a bit more complicated, but the basics are all the same. I just had more of it because I had a business and my husband had a business, and it got complicated from that standpoint because I was kind of dealing with three entities. But the basis is the same. You still have to set up a filing system, you still have to figure out what goes where. What you don’t want is a desk full of yellow stickies all over the place. You need to get an organizational way to go about it. And that’s important. You have to know when the mail comes in. It’s a valuable source of tracing paper trails, but you have to get rid of the junk. You have to know how to prioritize, who you have to call right away. One of the things that I found, and this can go no matter how small your estate is, or how really complicated, and I don’t think I’m that complicated by any means, but whatever it is, you’ve got to put together a team, which is the way I look at it. You must have an attorney. It doesn’t have to be a Park Avenue attorney. You can go online, there are lots of legal advice, but make sure you check it out very carefully. There will be papers to sign, you need an accountant to help you with tax ramifications changing whether you had everything in trust or whether your homes were in joint tendency or there are safety deposit boxes to find… You need legal and accounting advice and financial advice. I think the first thing that people think immediately is, I’m going to be destitute. I’m not going to have it. I’m not going to have the money. Is there insurance, is there not? There are so many different forms of insurance that you don’t even know you may get from your husband’s or wife’s business place, from an association, from a credit card. It’s your job to find these and then take action. And I tell you how to do it in the book. Jason Hartman: So insurance… there’s just a lot of complexity. Did you have a living trust? Jason Hartman: So was everything in the trust or did you have to deal… well, no. With a spouse though it’s different. You had probably an AB trust I believe, right? Susan Alpert: Yes. But I think many people aren’t aware of it. Actually we had the one trust and then after my husband died, I learned about that there are two trusts: there’s a decedent’s trust, which is also the B trust. And I had to figure out what the difference was between the two. And what money went into one, and what property went into the other. But one way or the other, if there is a trust involved, you now have two trusts. And when people don’t realize, well everything was in both our names, well what happens now is that everything that was in both of your names, now has to be switched over to your name alone. And that means signing myriads of papers, sending death certificates along with the change, having everything notarized. So one of the things I recommend immediately is get at least 15 or 20 original copies of the death certificate because that’s all that will be accepted. Yes, even though I had a trust and a will, the amount of work didn’t change. Jason Hartman: Wow, that’s just amazing. Do you have an estimate of how many hours you had to spend on this and how long it lasts? Is it sort of a three month or a six month process? How long does this go on? Or is it just ongoing forever? Susan Alpert: It’s very interesting that you should ask right now. Basically, it depends on how complicated your estate is, but generally it takes at least 6 months. In my case it took a year and a half. I had a lot of things that I had to solve. And last week, I got a piece of paper from something that I thought had been handled and wasn’t, and was told that if I don’t handle this immediately, and filed at the IRS, I will lose all of this. And I thought it was all done. So, does it end? It dwindles down 99.9%, but there’s always something else. But in my case it took me about a year and a half until I felt I had this all under control. Many people can do it in 3 months to 6 months. And again, it depends upon how prepared you were in the beginning. That makes up a major portion of what I’m going to talk about. It’s because you can do this preemptively. If somebody had said to me 6 years ago, go through this, fill out all these papers, know where this is, I would have said I’m living now. I don’t have to handle it. But what I found that people are doing now, young people, are going through all the lists with their spouses and saying, or preparing it if they have children and they’re alone, saying okay do I know where all of this is? Not for filling out forms or anything, but being aware that you will need these things. Do you know where they are? And again, if you’re a private person, you make a list of this is where everything is. You don’t just say what’s in it, how much is in your bank account, but you confined it in my left hand drawer in my bedroom. Or this is underneath the sock drawer in the study. Just let people know where things are. Jason Hartman: Right, exactly. Yeah. It’s unbelievable how much we accumulate during our lives both physically, and in terms of with outside parties, accounts and so forth, just to track all this down is just a huge, huge job. Well, anything else you’d like people to know on check lists, notifications, documentation, organization? Susan Alpert: Yes. I really do. I think it’s so important, and that’s why I created in Driving Solo and the Chaos to Control manual part of it, check lists where you can fill in all of the information of the names of anything from the insurance company down to the car and money that you owe, money that is coming into you. Policy numbers, beneficiaries. You have it all in one place, either in the book or you can download it. It tells you how to prioritize what you need to do, what you need to discover. There are so many government papers. People don’t think, well if I’ve been divorced, where are my divorce papers? Where do I keep my passport? Do I have any agreements for post office boxes? All of these things are there, and I have the check list where you check off whether you’ve completed it, or you’re working on it, or you’re going to do it later on. But you have in front of you everything from real estate partnerships if you have them to health care directives, power of attorney. So you really need to get yourself organized. And you have an A list of what you have to do right away, and then you have a B list. And part of those things, which I found as very interesting, one day I realized that my husband had so many miles that he had accumulated from flying. What happens to those? Isn’t that terrible? I called the airlines and found that with the death certificate I was able to transfer all of that into my name, and now I was able to travel great distances by just making that phone call. Jason Hartman: Sure, yeah. That’s the stuff they’ll hope you’ll forget about. Jason Hartman: Right. How many people would think, you get to inherit the frequent flier miles? That’s a very good point and for some people, that can be 700 thousand, a million miles. It can send you around the world many times, first class. Susan Alpert: Jason, what really prompted me to write the book was when I thought of that, and I said my goodness! I’m thinking of this and I’ve never heard of it before. Do they even do this? And that’s when I said, I found out stuff! I know things now from this horrible experience. So I can help somebody else. Jason Hartman: Sure, yeah. It’s really good to help get the word out there about this kind of stuff. What else would you like people to know about, then maybe phase 3, let’s talk about that for a moment and then wrap up there on a new road map: updates, cancelations, an evaluation of financial situation, budgets, moving forward. Susan Alpert: Yeah. Once you have done the paper work and all the filing and so forth, well then you say I’m really alone. I’ve got to figure out what to do with this. So you have to know what you have in your assets, what liabilities you have, and don’t make any decisions at the beginning. Don’t be hasty. Giving yourself a year before you make any major changes, and that is very vital. You’re not thinking right. I was so emotional. So I advise people to do that and then I advise after they know everything that they have, and they’ve figured out what the costs are and expenses, and that’s the thing that many people don’t do. They know they live within their means and they spend money, but you don’t realize how much you spend on greeting cards and birthday gifts, and the latte that you’re getting at the coffee shop, once you kind of get a handle on what you’re spending and what you have, you say well now what am I going to do with my life, and then you need to talk to somebody professionally, a financial planner. And at the same time you’ve got to get out in the world, little by little. Jason Hartman: The thing I want to say there, I’ll let you finish your thought there because it sounded very important of course, but the thing you’ve got to be careful of is you go talk to that financial planner and you’ve got another person that’s potentially about to rip you off. So you watch out for the sharks of Wall St I call them. Susan Alpert: Oh, believe me. From personal experience, I overpaid on so many things that was very unnecessary had I had my book. I wish I had my book then. It would have helped me. Don’t just go to the first person that you see online for a name. Ask for referrals from people that you really trust. And when you talk to somebody, your gut will tell you if this guy is just too sleek for me. This is not going to work. Speak to a few people, get their opinions, you don’t have to reveal everything that you have, but tell them what your concerns are and what do they recommend for you. That’s due diligence and you have to do that. Jason Hartman: Yeah, well fantastic advice. Susan, thank you so much for sharing this with us today. The book is on Amazon.com with 14 reviews. It has 5 stars currently. It’s entitled Driving Solo: Dealing with Grief and the Business of Financial Survival. If one experiences grief, let’s not make it worse by having a second set of financial grief afterwards. So get a copy of Susan’s book. And Susan also, give out your website if you would. Susan Alpert: Yes. It’s www.susanalpertconsulting.com simple. My name with consulting because I do run the Chaos to Control program as well. so it’s all pretty much there. Jason Hartman: Yeah, and by the way, tell us a little bit more about that program. We talked about the book more, but what is the program? Susan Alpert: The program is actually the second half of the book. When I started the program, I needed a tool for people to work with, and that tool became a manual. And then I said, this is only good for people I’m working with one on one, and a lot of people need that. They need a support at the same time, so I work through these steps with them and guide them into finding what they need with a good emotional support in the background. But then, I put it in the second half of my book so it’s accessible to anybody if they have the book. Jason Hartman: Fantastic. Well, Susan thank you so much for joining us today and keep getting the word out about this. Susan Alpert: Thank you so much Jason. I really appreciate speaking with you.